No plastic here: aluminum with maple sides. Inside, you’ll find a 4-operator FM synth with adjustable glide (looks like you could route it for virtual analog, too) and the usual filters, envelopes, LFO modulation, etc. The synth looks really flexible, and there are some especially nifty features: external audio input, integrated ring modulation (exterminate! — uh, cough, sorry), built-in sequencers that also function as modulation, and even a tube distortion / filter option. MIDI input / output, even envelope follower in, and, for you true analog junkies, an optional control voltage (CV) input. 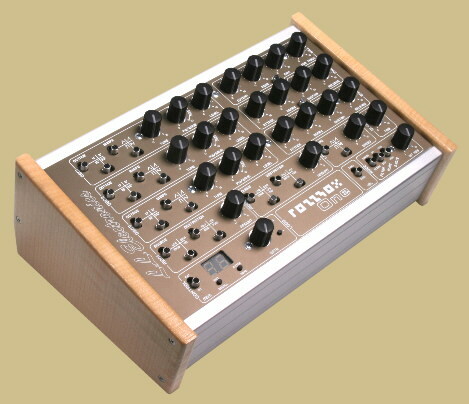 Gorgeous, compact, flexibly-designed, and it’s not another cheap Moog clone. Now the only question is, where / when / how much? I’ll get back to you if I hear more.